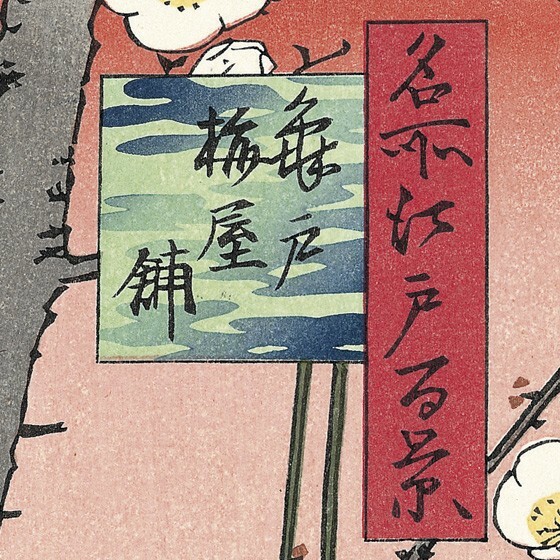 From the series "One Hundred Famous Views of Edo"
This rather fanciful composition seems to have appealed strongly to non-Japanese. It is well known that Van Gogh imitated this print in his oil painting. 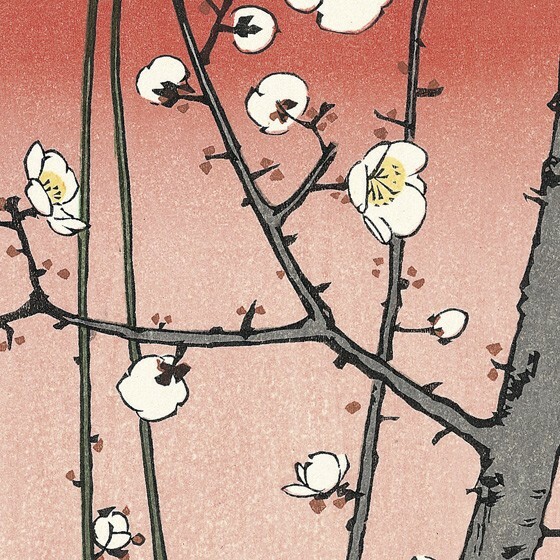 Hiroshige has depicted in close-up an unusual variety of plum tree, with stems and branches extending far into the distance to emphasize the magnificent sight. The light pink background symbolizes the light and warmth of spring. 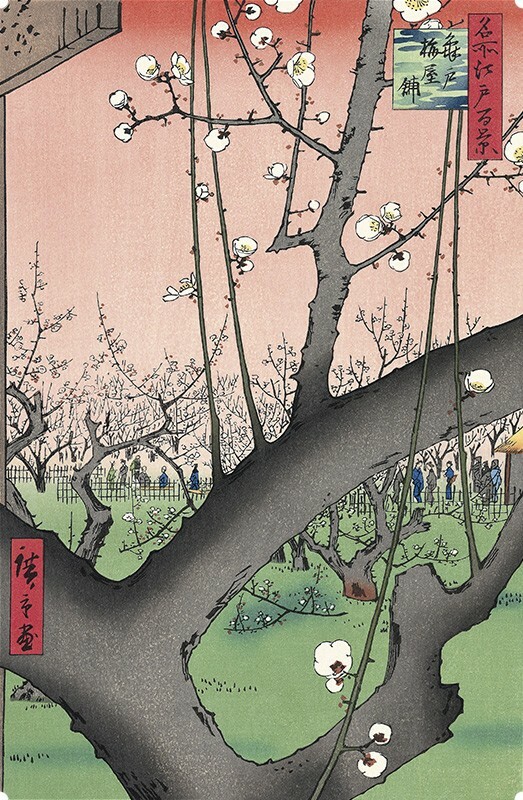 The Ume Yashiki (Plum-tree Garden) in the sub-title refers to the garden of plum trees within the house of the farmer named Kiemon, which was located at part of what is now Kameido 3-chome north-east of the Kameido Tenma-gu Shrine. Famous especially among the trees here was an aged one known as the Garyu-bai (Crouching-dragon Plum), celebrated for its fantastic shape with each bough creeping on the ground, taking root, and giving forth another bough, this process of growth repeated times again. The "Edo Meisho Zue (Graphic Guide to Celebrated Places of Edo)" describes the tree as follows. "It blossoms are supreme; double-petalled and pure white, and very fragrant. It forms recalls a crouching coiled dragon. It extends over several hundred feet to four directions in the garden, but is not so tall. Each bough creeps half way into the ground, then comes out and sends forth branches. We can hardly tell which are the stems and which are the branches. They furthermore are crooked, each looking like a shapely independent tree. It therefore is named the Garyu-bai...." It states further that the fragrance filled the neighbourhood. 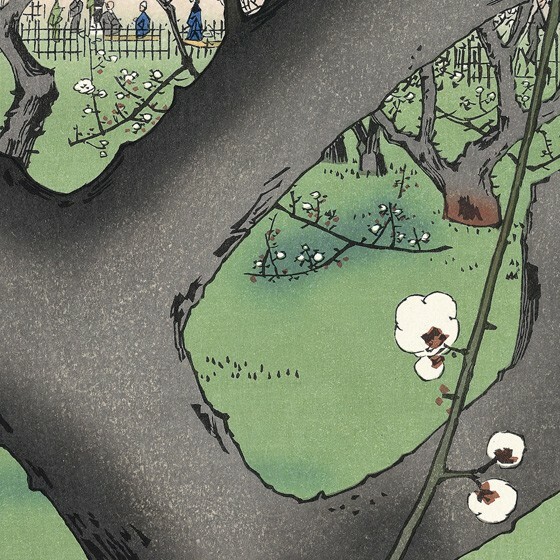 Hiroshige has depicted part of the unusual tree in a very close view to attract the viewer's eyes, with other stems and branches extending far into the distance beyond this foreground to emphasize the magnificent sight. Two couples of slender branches rising straight up from the stout stem are interestingly reminiscent of a dragon's whiskers. 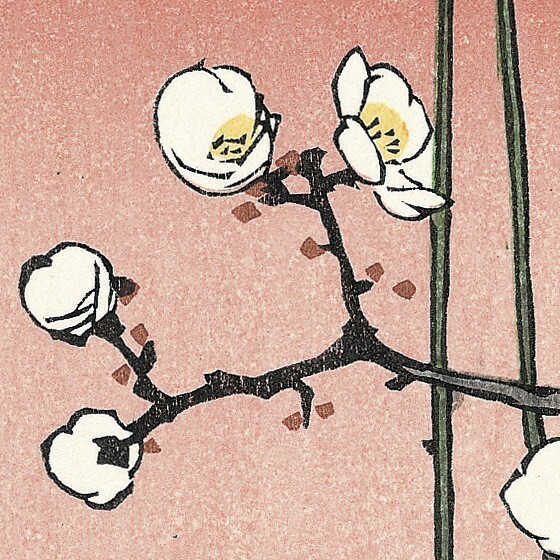 The gray stem is dotted here and there with bokashi ( shading) of a more intense shade of the same colour, imparting an effect of three dimensionality and vigour to it - probably a characteristic of the first impression of the print. A few white blossoms this side of the stem suggest deep fragrance. The background is a light pink symbolizing light and warmth of spring. Absence of unnecessary elements has resulted in a clear, dignified composition. The rather fanciful composition seems to have appealed strongly to foreigners. It is well known that the post-impressionistic artist, Van Gogh, imitated this print in oil painting. 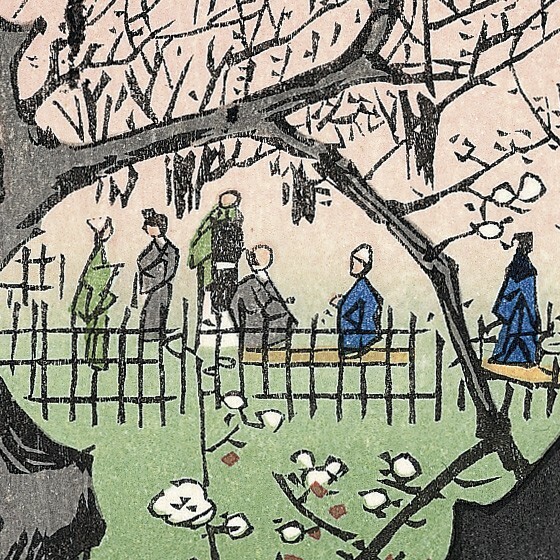 The famous garden suffered badly from flood in 1910 and the majority of the plum trees died. More trees died thereafter due to soot and smoke from nearby factories, until the garden was abolished. 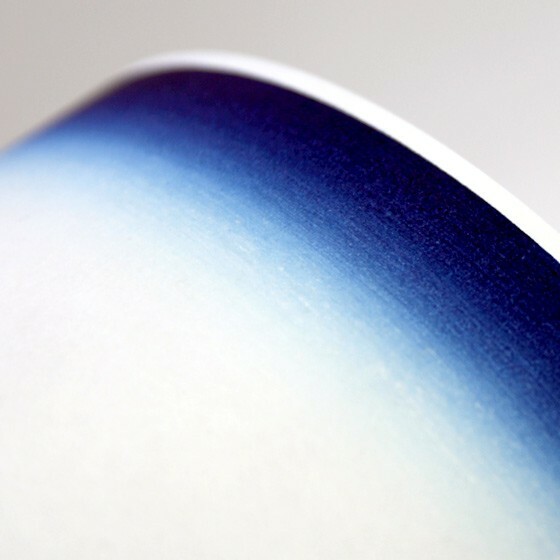 Through careful research, the use of traditional techniques and materials, and the highest standards of craftsmanship, the artist are able to reproduce original Ukiyo-e with the highest level of accuracy.